For a freshman, Holden Koons has already accomplished things that other players spend their entire high school tennis careers trying to do. 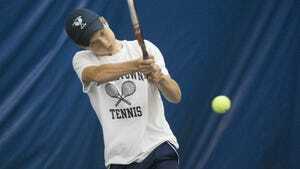 Dallastown's top player won YAIAA singles and doubles titles, a District 3 Class AAA singles title, and will be going for a state championship beginning Friday. Koons will take on Strath Haven’s Xandy Hammitt, the third seed out of District 1, in the first round of the tournament at the Hershey Racquet Club. Koons has been playing competitive tennis since he was 8 years old and already had a bit of a reputation coming into his freshman year. Koons started the season as a four-star recruit on the Tennis Recruiting Network, and has since gone on to be ranked second in the state among freshman. Koons is also ranked 12th in the mid-Atlantic region among freshman and is ranked by the USTA. 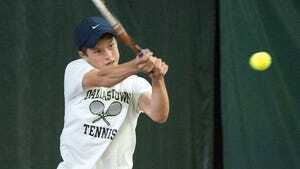 The experience of playing tennis has been a good one, according to Dallastown coach Mark Koons. “Holden has had a blast,” he said. Holden Koons will begin to take his next steps on Friday. Koons was back on the court preparing for the state tournament. He had taken three days off after tweaking his back during the district semifinals, but coach Koons said it wasn’t an injury and that Holden was OK. Since then, his time on the court has been spent working with other players on strategies and working through certain situations that could come up over the weekend. Success in the upcoming state tournament is twofold for Koons. Mark Koons wants to parlay any success his son has moving forward as they get ready for other tournaments ahead. What: First round match of the 2016 PIAA Boys' Singles Tennis Championship. If Koons wins, he'll move onto the quarterfinals round at 3 p.m. Semifinals and finals rounds are scheduled for Saturday. When: First-round matches start at 9 a.m.